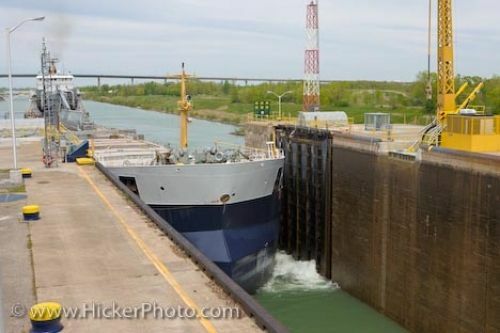 A large bulk carrier ship enters between two tall metal walls of Lock 3 at the Welland Canals System. These bulk carriers are used to transport large amounts of un-packaged cargo. The St Catharines Museum is located at the Welland Canal. In the distance of the St. Lawrence Seaway is a bridge that spans its waters.